You will need a sheet pan and an extender, plus parchment paper and a release spray. Place the parchment paper on the sheet pan and place the extender on top of it. Spray the pan, making sure not to miss the sides of the extender. Pour the batter into the pan filling it about 3/4 of the way to the top. Bake the cake according to the recipe directions and then gently remove the extender. Using an extender you can prevent the sides of the cake from over-baking, making every bite just as good as any other, and you can eliminate trimming. If you are looking for aesthetic appeal, an extender also allows for straight sides. 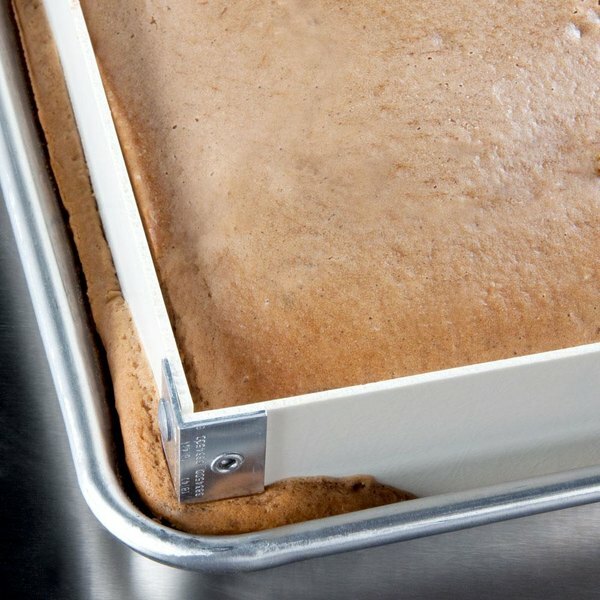 Watch this quick video to learn how you can use a pan extender with your sheet pans to bake delicious cakes with ease! The material matters in food processing, handling, and storage. Composites are lighter than metal, stronger than thermo-plastics, tougher than wood, and highly resistant to chemical cleaners. Our composite food service containers don't warp or slide like plastic. They don't rust or bend like metal. At MFG Tray we like to encourage our customers to think inside the box and consider how exceptionally durable composite products are to their food service application. The challenges within the food service industry are unique. Kitchen temperatures, freezing cold, constant use, and never-ending sanitation are tough on handling products. 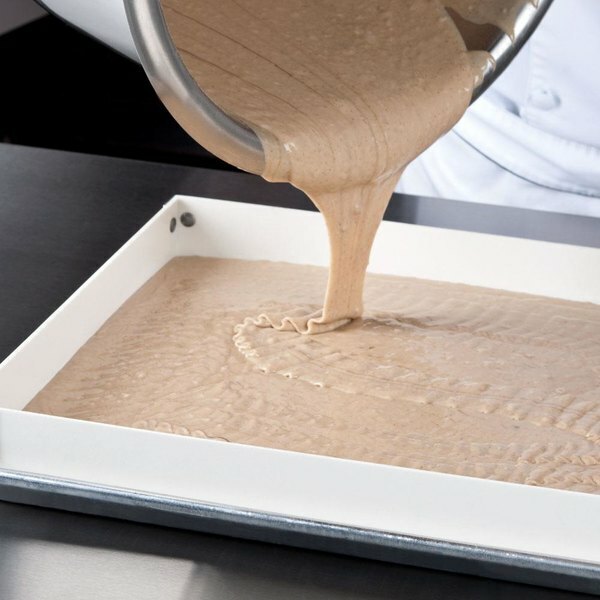 MFG Tray composite products deliver proven performance in many food service applications. We offer an array of products specifically designed for food storage, preparation, and merchandising, including dough boxes, bagel boards, pan extenders, food storage and prep bins, non-slip serving trays, and cafeteria and display trays. 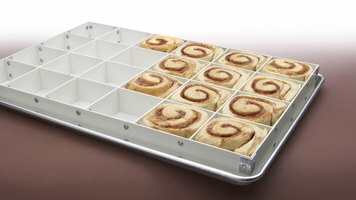 MFG Trays' food service products come in several colors and offer additional features, including lids and dolly carts. Composite trays and containers are safe for food service. The smooth, non-porous surface resists odors, stains, and mildew. They're not harmed by detergents, and may cleaned in a conventional dishwasher, or steam cleaned. They can also handle standard baking temperatures, or be frozen, or refrigerated. Thanks to their composite design, MFG food service products bring strength, along with structurally strong stacking. One of the biggest challenges in the food lines to maintain a level of cleanable design, that something we always look at from an engineering standpoint, not only the design, but also the materials. A lot of these come into contact with food, or in a food zone area, and so we have to supply food-safe materials, ingredients in our formulations and likewise a cleanable design so that as they run them through their process, they can maintain a cleanable and sanitation through the food service industry. With the multi-directional fibers that are in our parts, it increases the tensile strength of the part, makes it a little more rigid than a thermo-plastic part would be. Also, it increases thermo-stability, so we don't have them all over the place dimensionally. Our materials are proven to withstand so much more than other materials that are out there. I have even parts at home -- my grandmother worked here, my mother worked here -- I have parts at home probably from the early 70s that are just as strong today as they were then. The strength of our materials and the components in them are unbeatable. The appearance is very critical. We do have specific jobs that we do dimensions. We have a bagel board where we check the edge crown, and we use our FaroArm to do that. 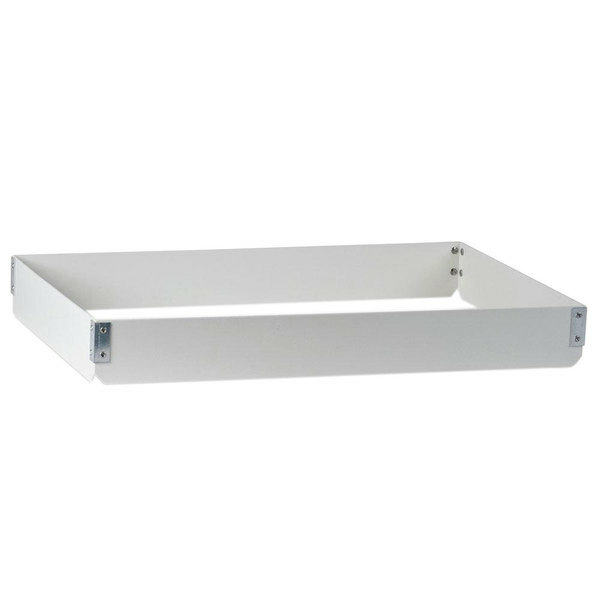 We have a hot/cold tray that we also have to check the center crown on, because it fits in racking systems, and if they are out of those tolerances, they won't fit for the customers. We want our customers to be confident that the product they are putting their own product on is something they can be proud of, that they know their product is going to look good on our product. The molded fiberglass tray has seen a lot of evolution over the years. Many people think that serving trays are serving trays, but they're really not. Over the years we've come up with different ways particularly like our non-skid tray, of revolutionizing that product line within the food service market, to give the customer base something base, that was specifically given to use by customers we had who weren't happy with what they were receiving, so we were able to provide them with something different, something that lasts longer, something that's more durable, dishwasher-safe, better than what the competition could provide. In terms of other products, we always try to stay ahead of the curve. We're always looking for what's changing in the food service market and what we need to do to stay ahead of that. To find out about all of our material handling solutions, check out our website at www.mfgtray.com, or find us on Facebook. Materials matter! Learn why composite products from MFG Tray offer incomparable quality and durability by checking out this short video. From dough boxes and bagel boards to non-slip serving trays, they have everything to offer to make your job easier and more efficient. How should I clean / maintain this MFG pan extender? This pan extender can be cleaned in a low or high temperature dish washer, but never soak it for a prolonged period of time. If you prefer to scrape the pan extender rather than washing after each use, it is recommended that you use a plastic scraper. When using the pan extender, a release spray is needed to prevent sticking and will produce a better final product. Additionally, if you are using a pan extender with cells, it yields the best results when used in a convection oven. 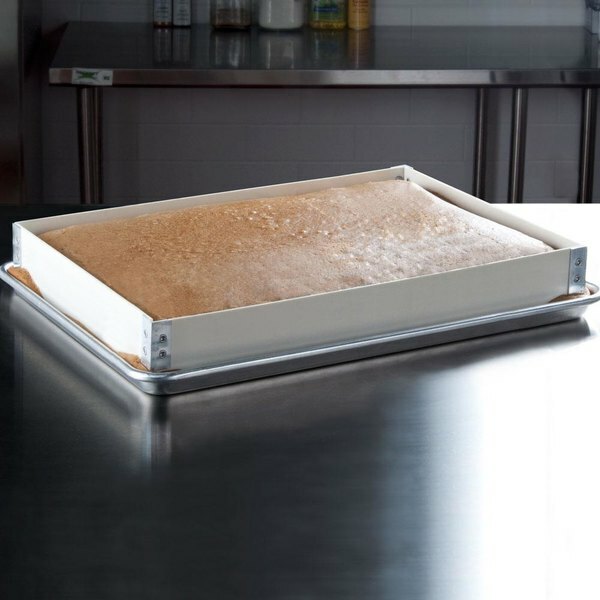 Perfect for bakeries, cafes, and restaurants, this MFG Tray 176601-1537 full size pan extender is molded from an oven-safe, dishwasher-safe, and temperature-resistant composite that offers better insulation than both aluminum and stainless at less cost. Applications include sheet cakes, brownies, corn bread, sweet rolls, and various related baked goods. This item may also be used for chilling or freezing products. 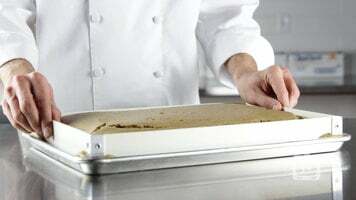 For use with standard baking sheets, MFG Tray pan extenders result in straight sides and edges on baked goods so that every piece has the appearance of a center cut. 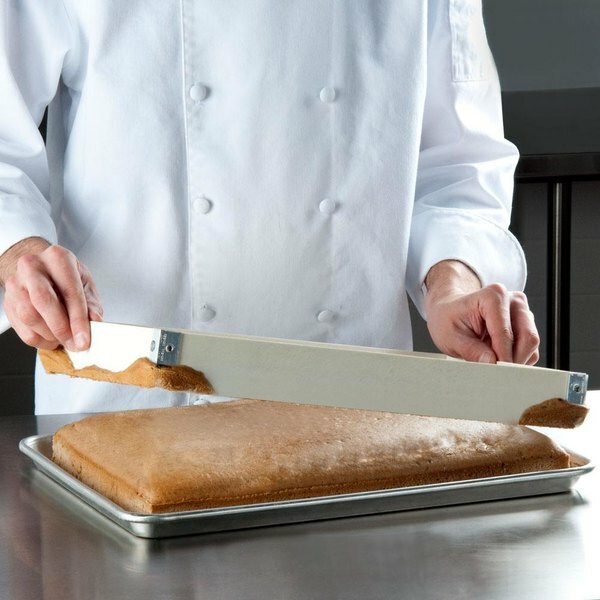 This extender ensures that baked products are even in height, color, and texture across the entire surface, insulating the edges of the product to prevent over-baking and eliminating losses due to trimming. This product can expose you to chemicals including Styrene, which are known to the State of California to cause cancer, birth defects, or other reproductive harm. For more information, go to www.p65warnings.ca.gov. WARNING: This product can expose you to chemicals including Styrene, which are known to the State of California to cause cancer, birth defects, or other reproductive harm. For more information, go to www.p65warnings.ca.gov. The Full Size Pan Extendr - 5" High. It is great for extending your favorite cakes. 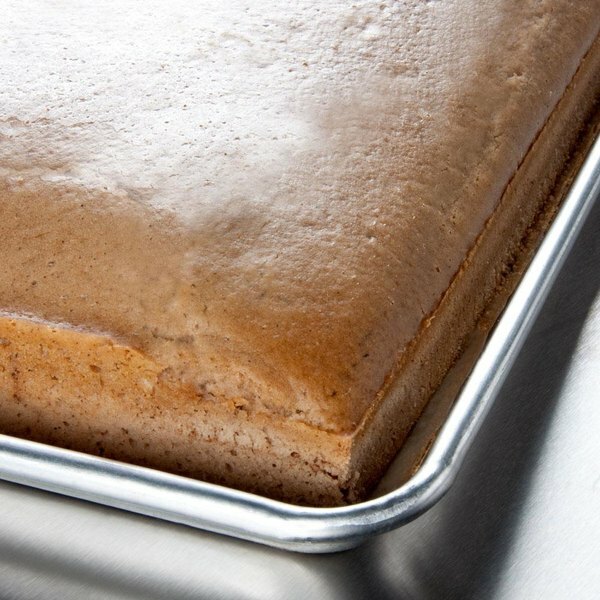 It extend's the hight of your sheet pan and insulates the edge of your cake to prevent over baking. It also eliminates trimming.It's dishwasher safe. The prise is right.